View from the Window at Le Gras. ca1826. 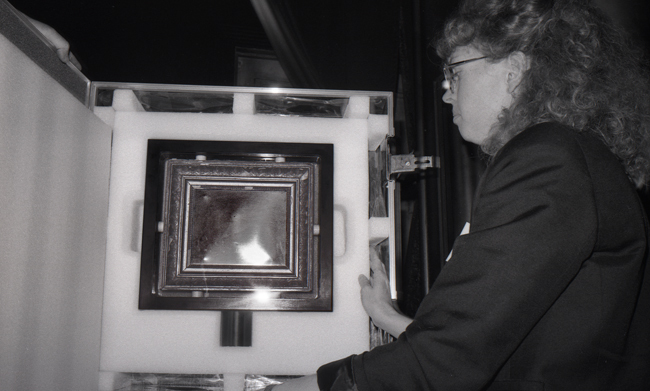 The First Photograph, housed in its original presentational frame and sealed within an atmosphere of inert gas in an airtight steel and Plexiglas storage frame, must be viewed under controlled lighting in order for its image to be visible. In general, this procedure also requires viewing within a darkened environment free of other incidental light sources. This effect, suggestive of Gernsheim’s first viewing of the mirror-like effect of the pewter plate, attempts to give each viewer the chance to experience the effect of discovery from which the image can be seen to seemingly emerge from the original heliograph plate.